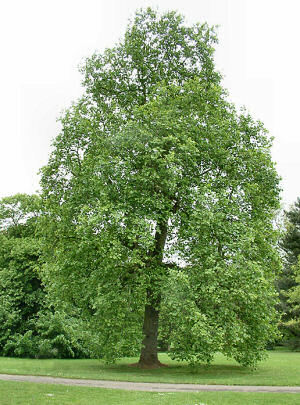 In the Magnolia family, Liriodendron tulipifera is also known as âYellow Poplarâ or âTuliptree.âÂ It has a very straight trunk, and reaches heights of over 100 ft. (max 200ft) and diameters of 3-4 ft. or larger. It is one of the largest hardwood trees in North America. Tulip Poplar gets its name from its tulip-like flowers. Flowers are perfect, greenish yellow and blotched with orange. They appear in May after the leaves. Leaves are deciduous, simple, alternate, 5-6 in. long, possessing 4 lobes with broad shallow sinus; tips are abruptly truncated or heart-shaped. Autumn foliage is bright yellow. Twigs are red-brown, and have a large stipule scar encircling the twig. Bark is light gray and smooth on young trees, and becomes thick and deeply furrowed with age. A native to the Southeast, Tulip Poplar, is common in moist, well-drained soils, especially along stream bottoms and on lower upland slopes, but also in moister soils in mixed deciduous woods. It is very shade-intolerant, requiring almost full light for successful reproduction. It is an economically important hardwood. Large volumes of timber are harvested annually for furniture, as well as crates, toys, musical instruments, and pulpwood. It is also used as a shade tree because of its rapid growth, beautiful form, brilliant yellow autumn foliage, and tulip-like flowers.